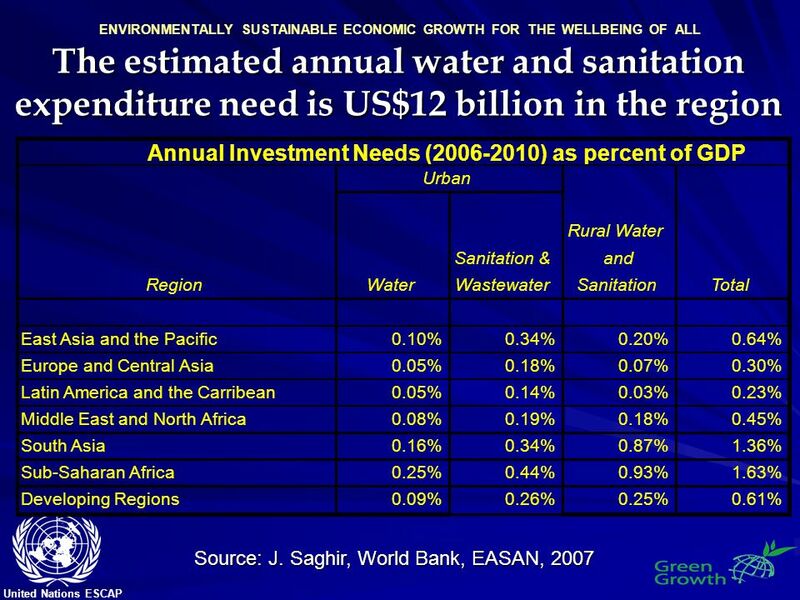 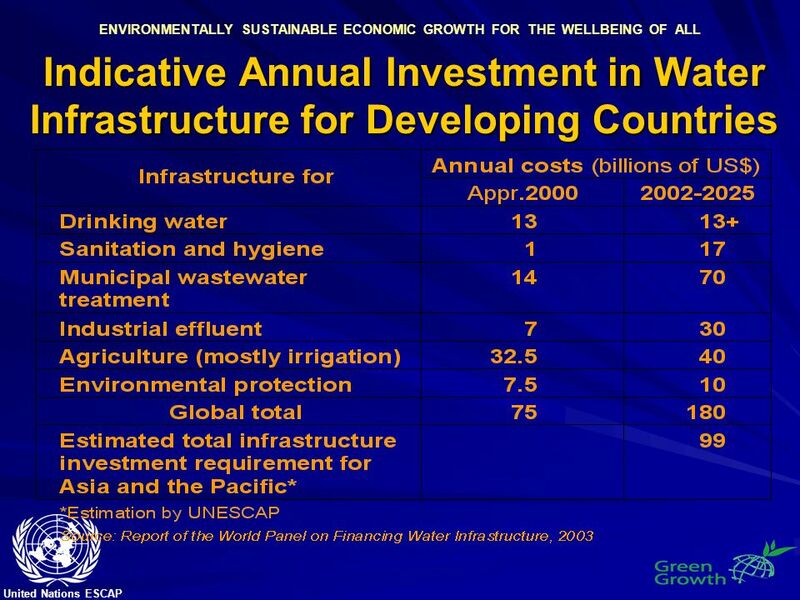 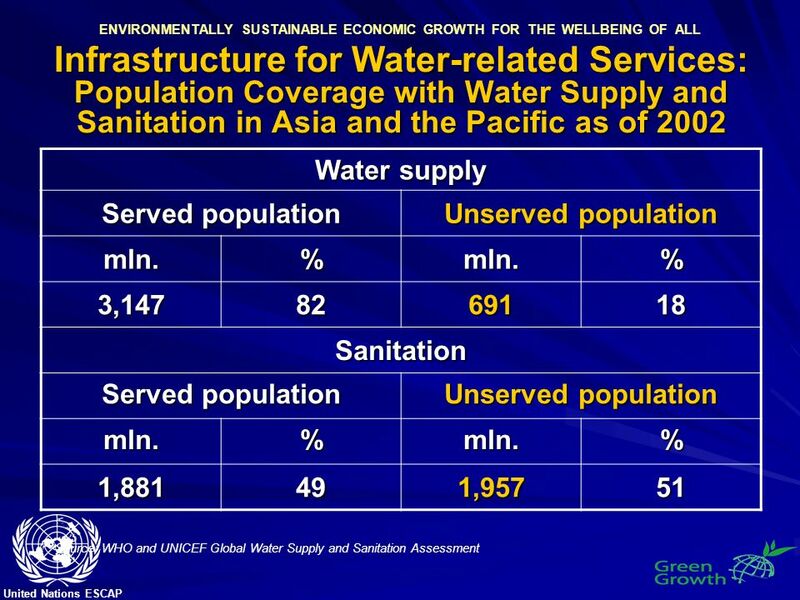 20 United Nations ESCAP ENVIRONMENTALLY SUSTAINABLE ECONOMIC GROWTH FOR THE WELLBEING OF ALL of US$9 billion loss/year >70% can be averted (US$6.6 billion) Investing in sanitation results in huge benefits Water and Sanitation Program (2007). 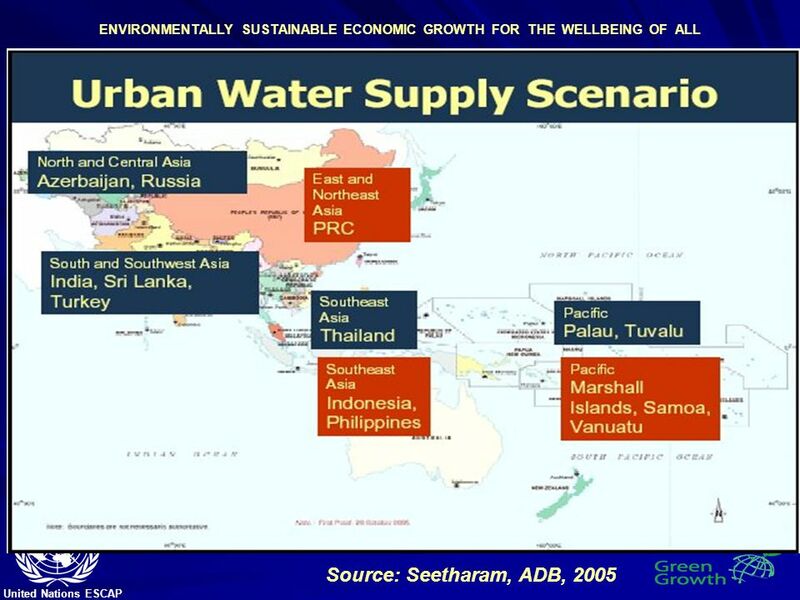 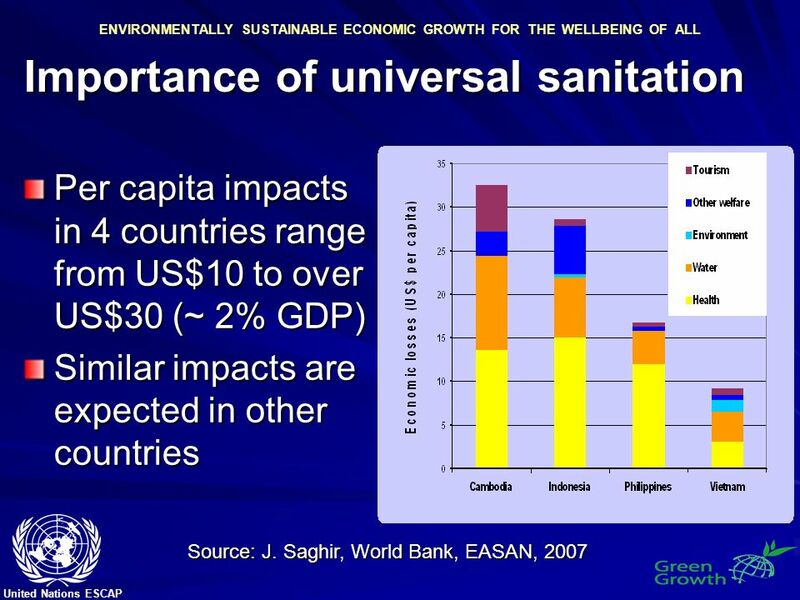 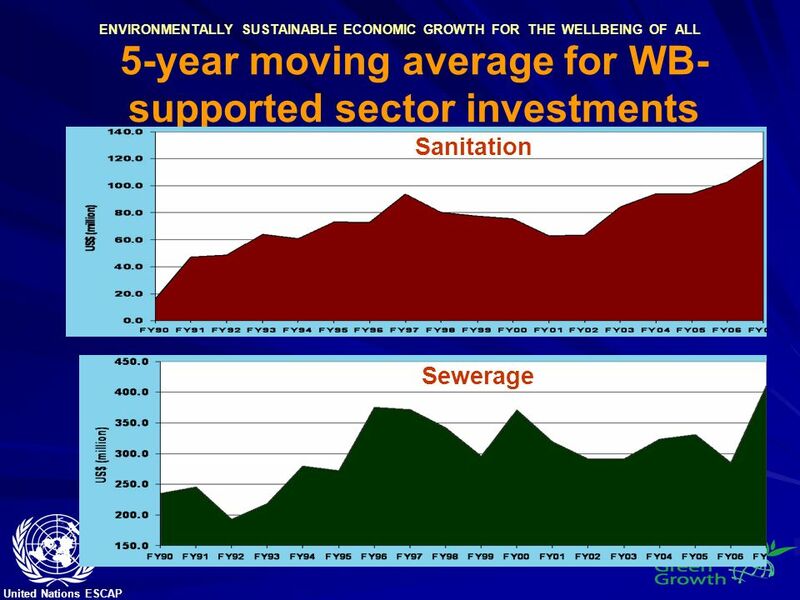 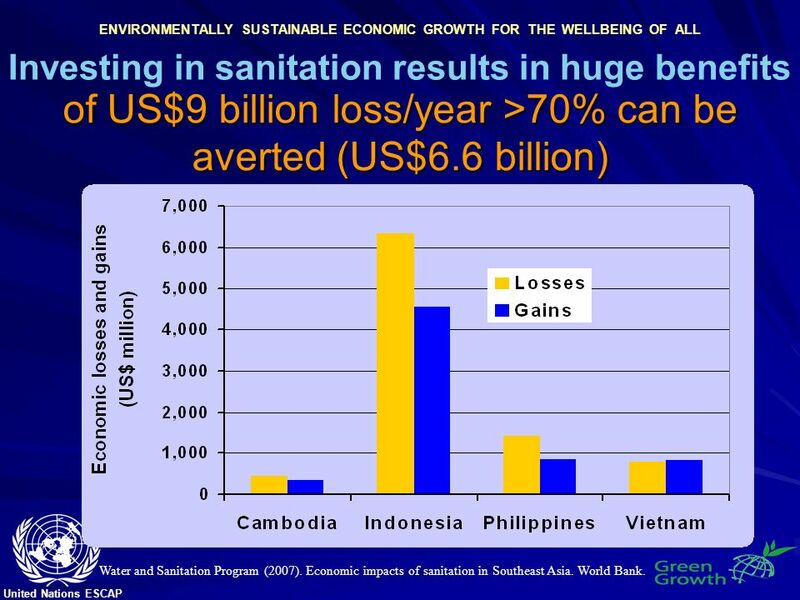 Economic impacts of sanitation in Southeast Asia. 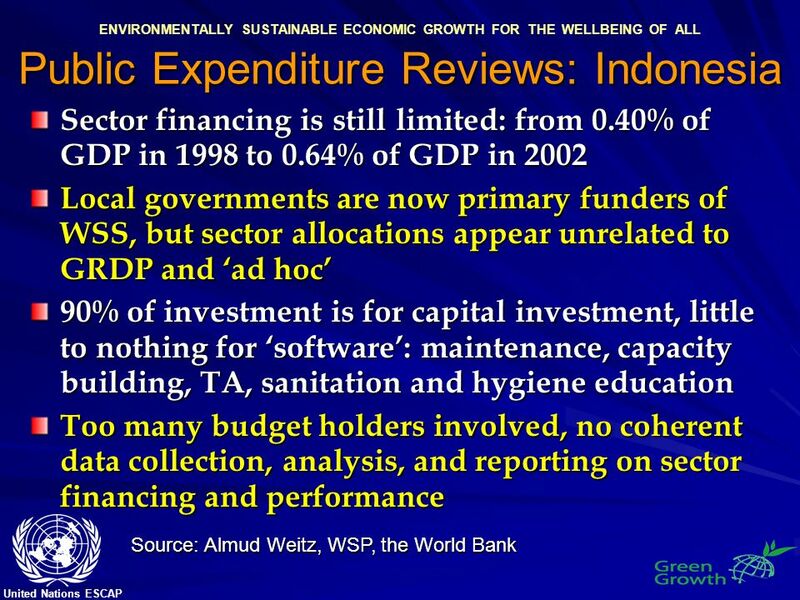 World Bank. 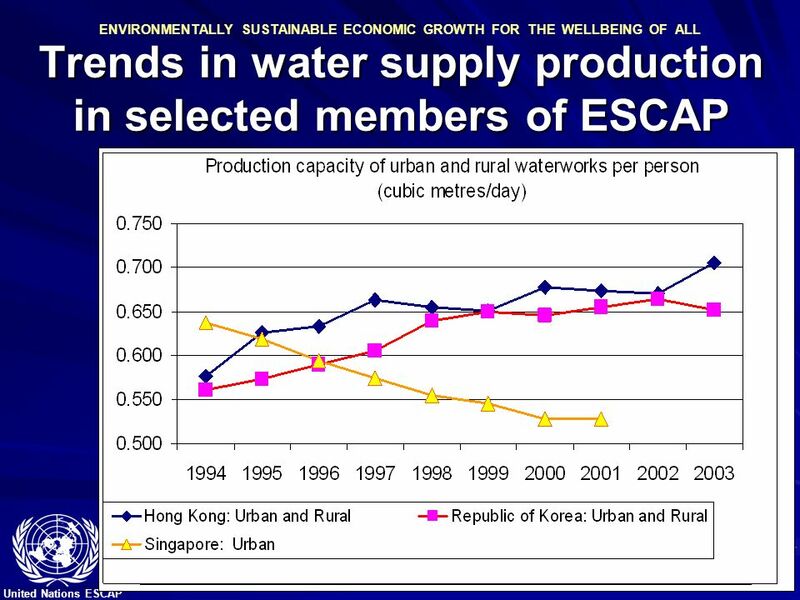 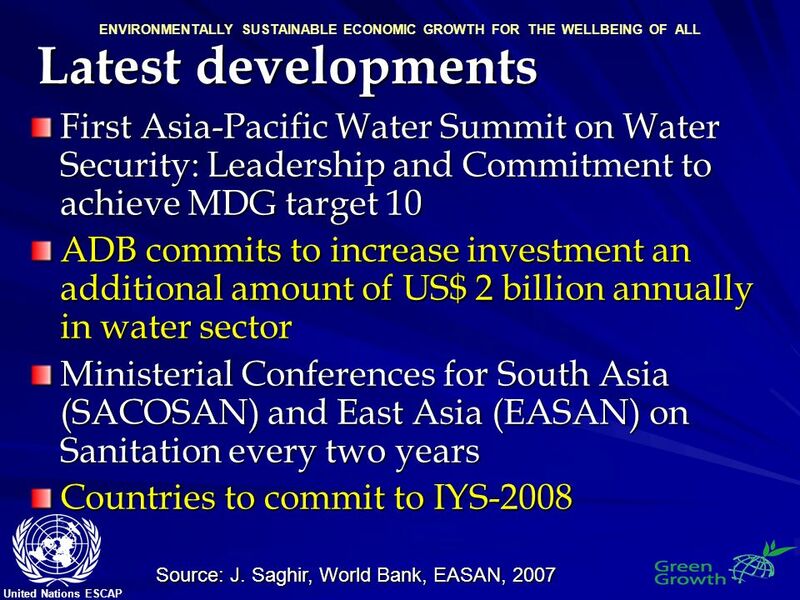 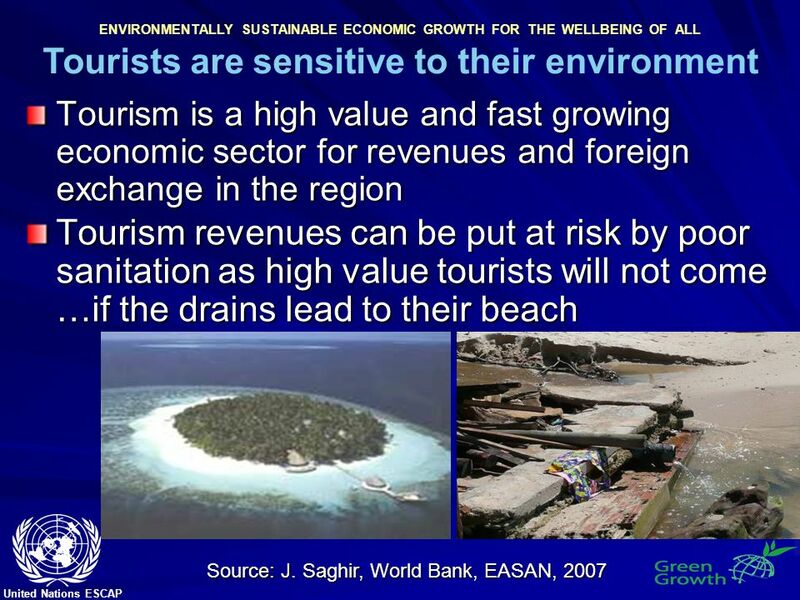 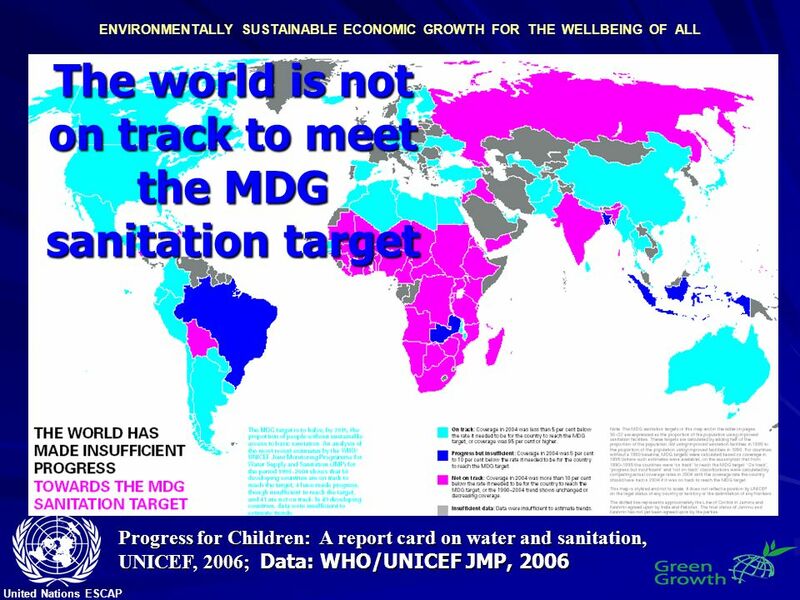 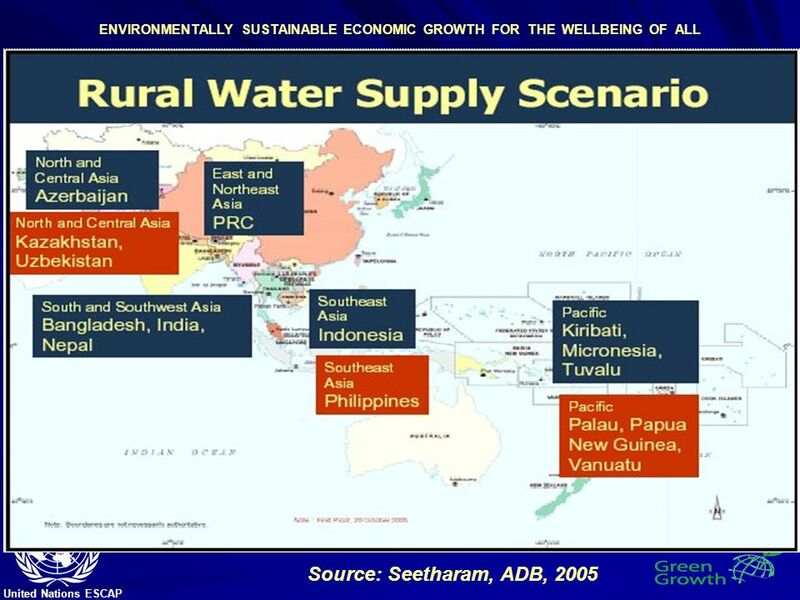 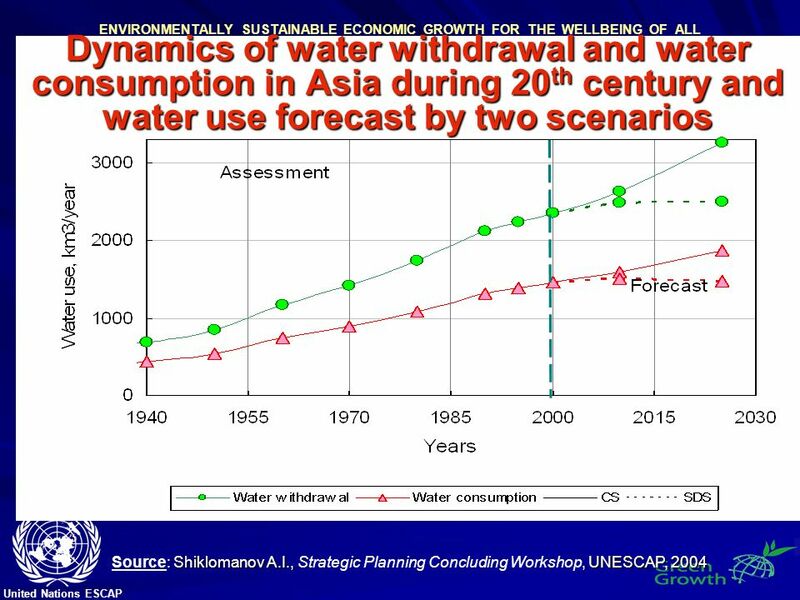 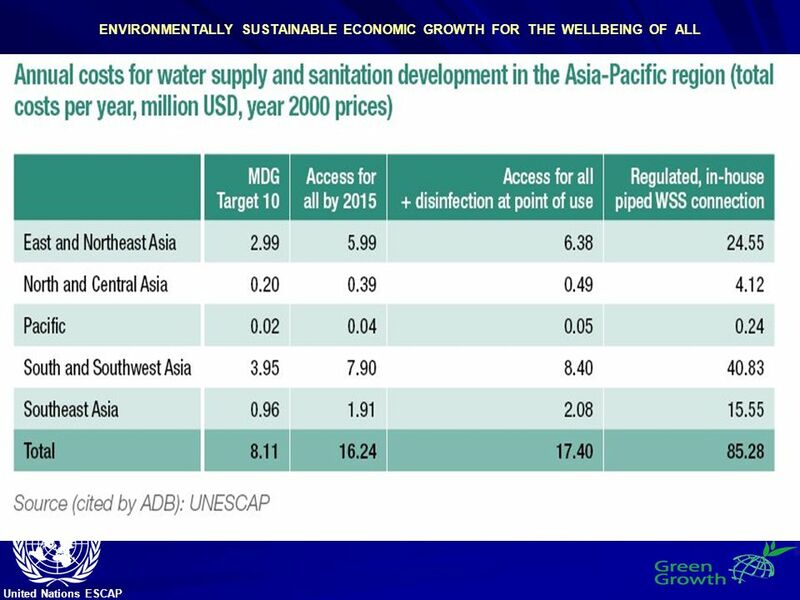 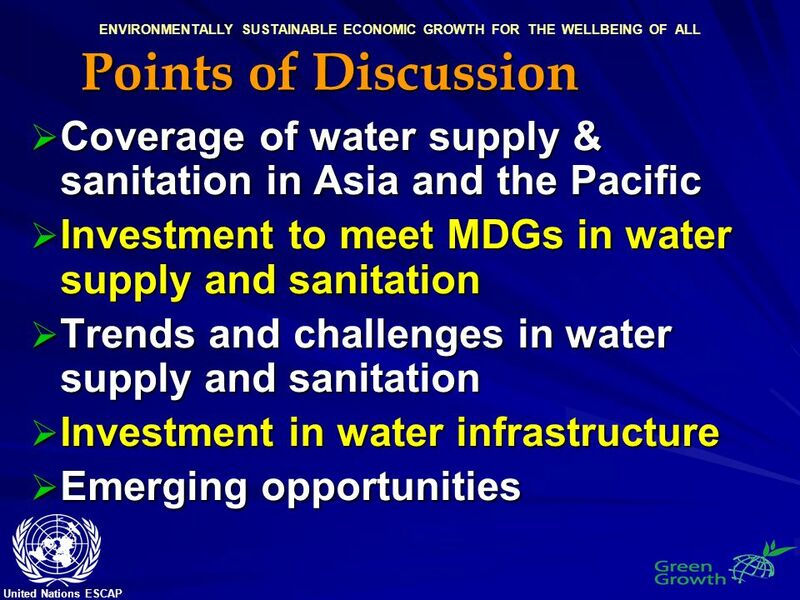 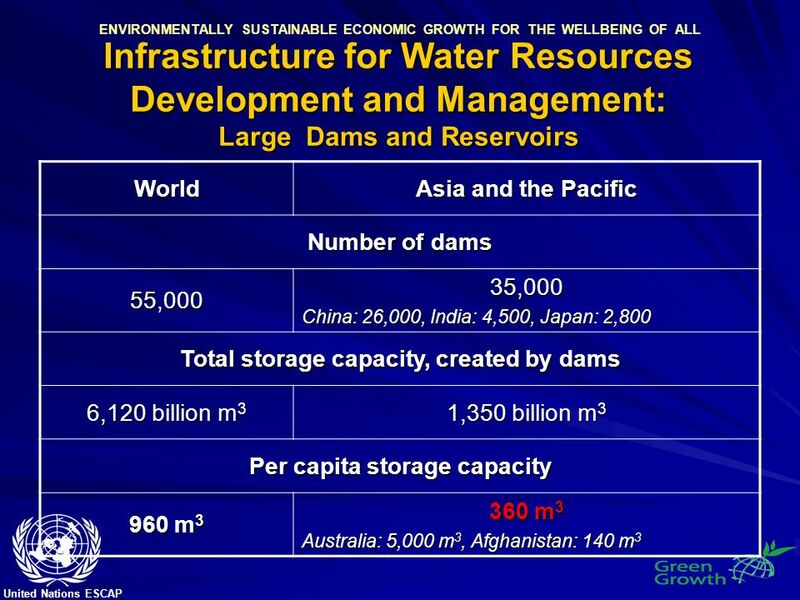 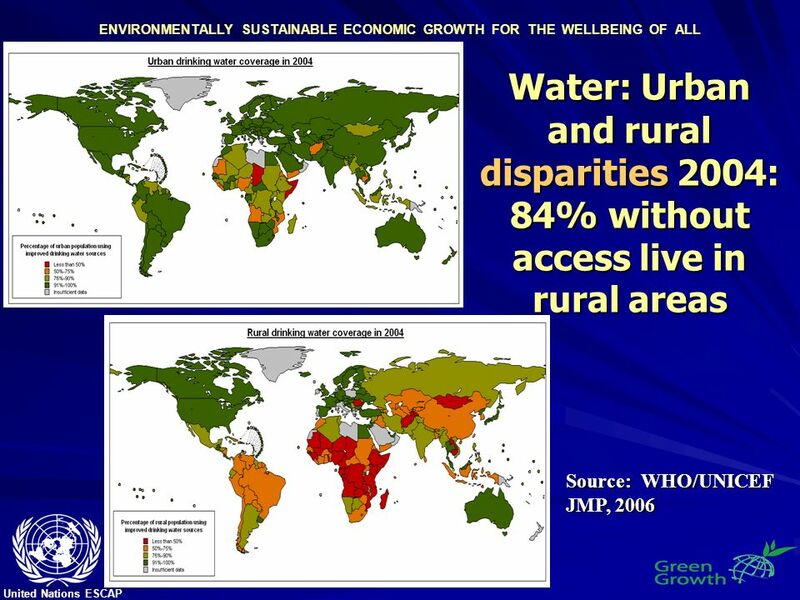 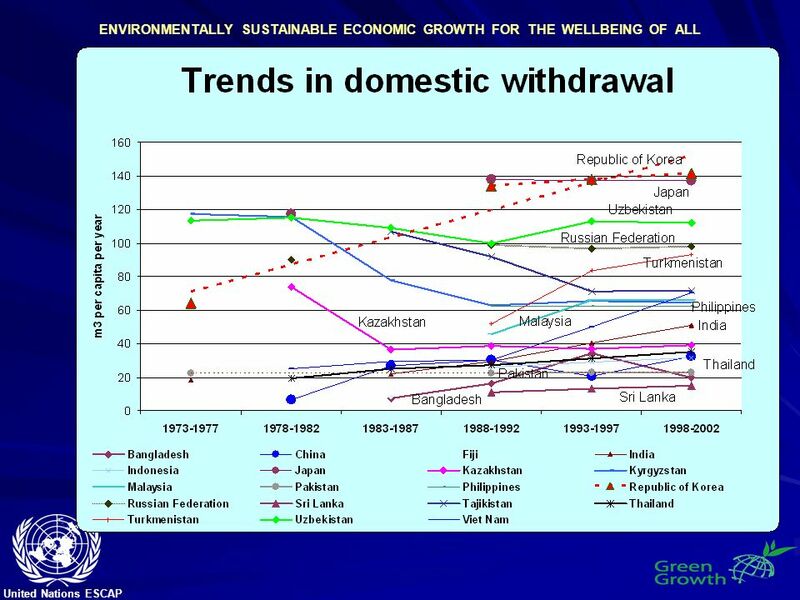 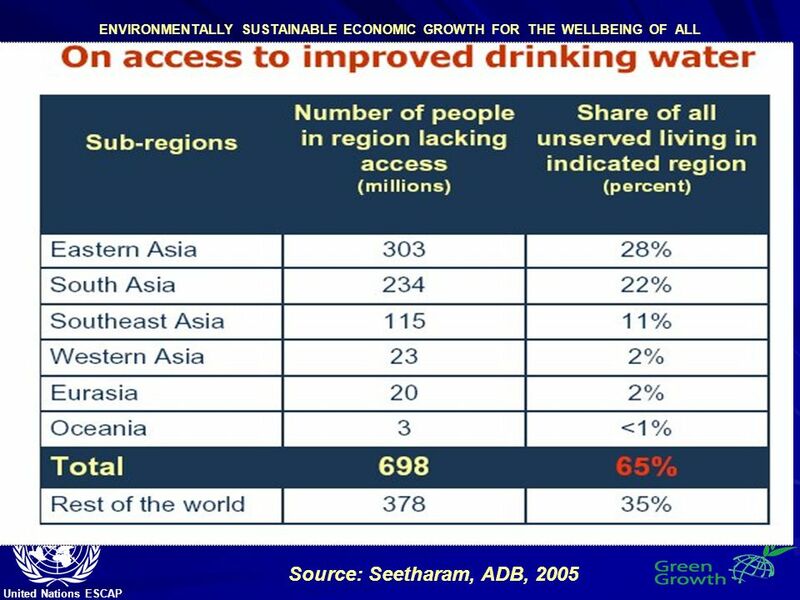 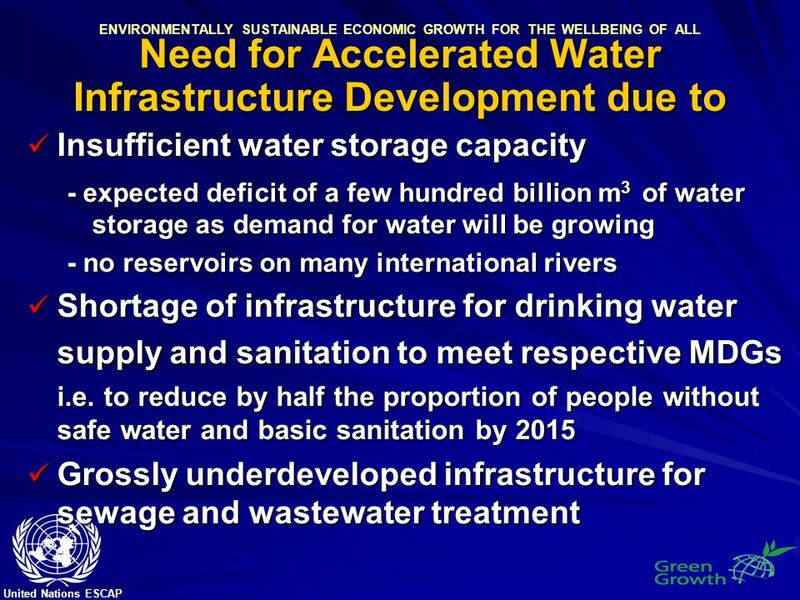 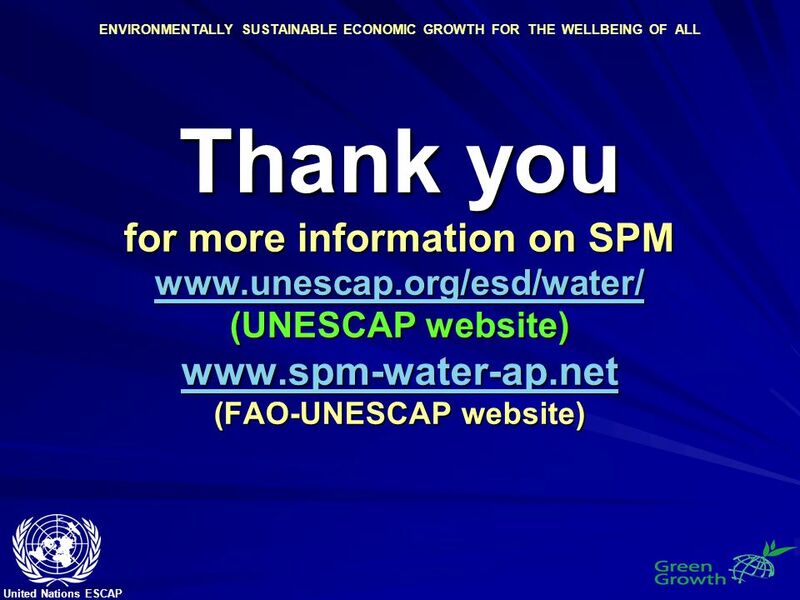 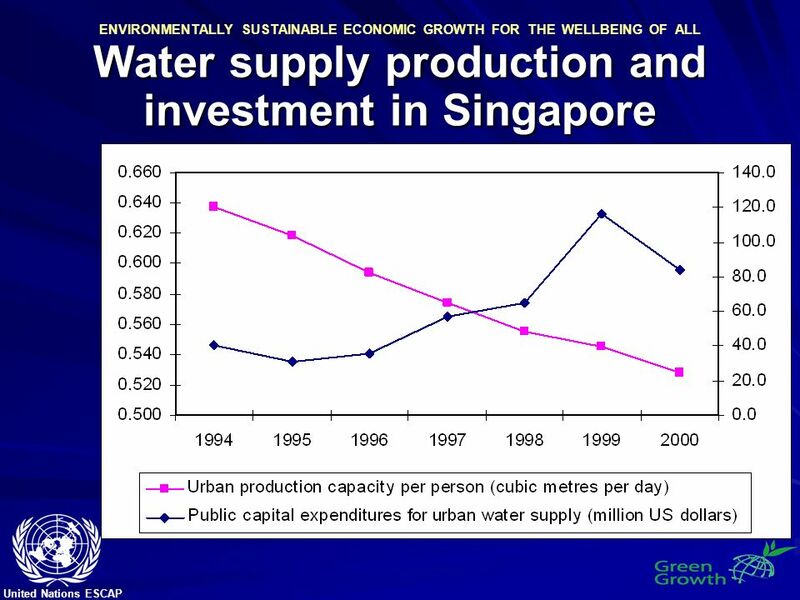 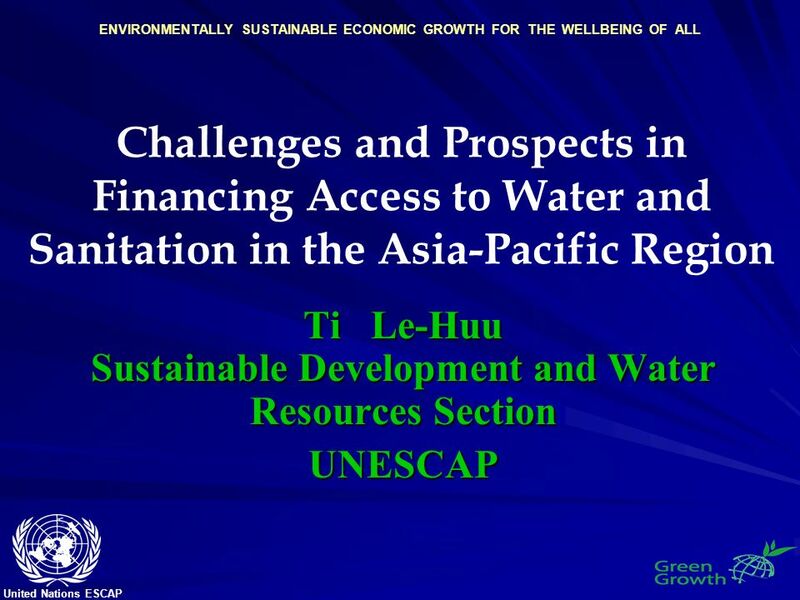 Download ppt "United Nations ESCAP ENVIRONMENTALLY SUSTAINABLE ECONOMIC GROWTH FOR THE WELLBEING OF ALL Challenges and Prospects in Financing Access to Water and Sanitation." 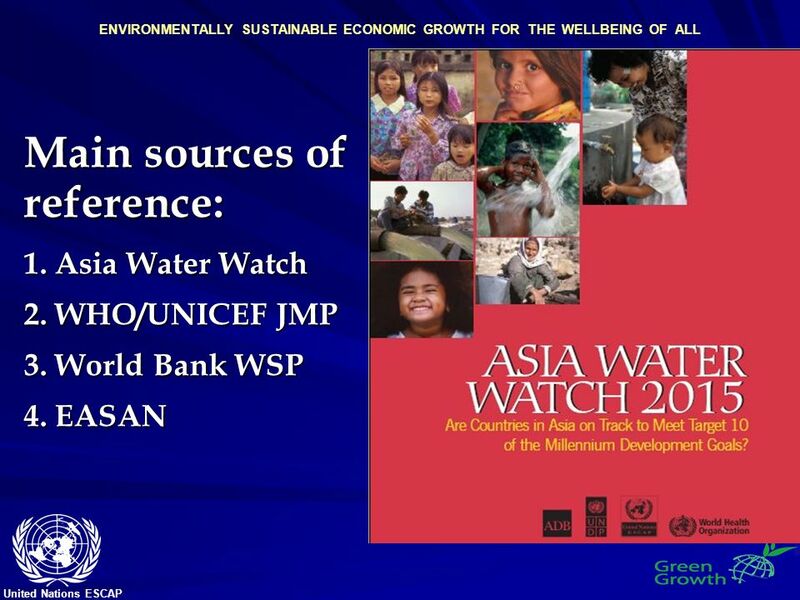 1 Dr. Noeleen Heyzer Under-Secretary-General of the United Nations and Executive Secretary of ESCAP MDG Priorities in Asia and the Pacific. 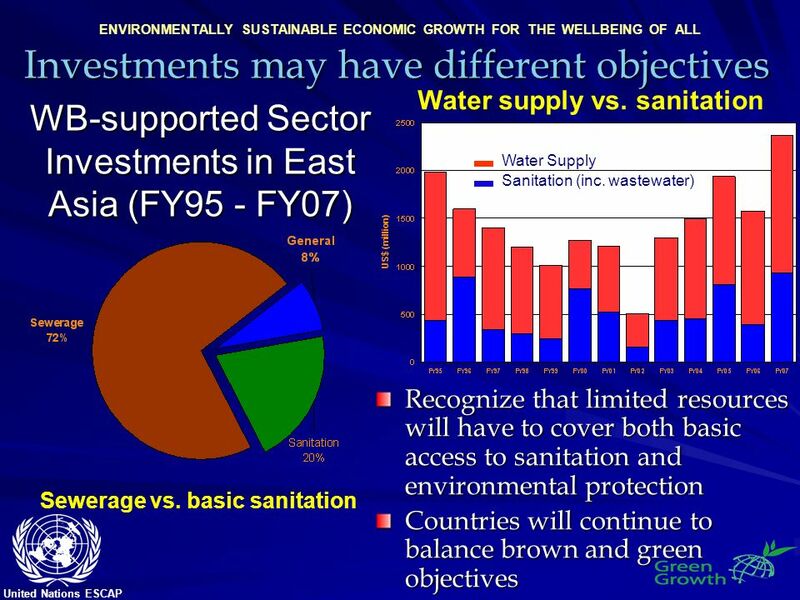 State of Water Statistics in Jamaica Regional Workshop on Water Accounting 16–18 July 2007 Santo Domingo. 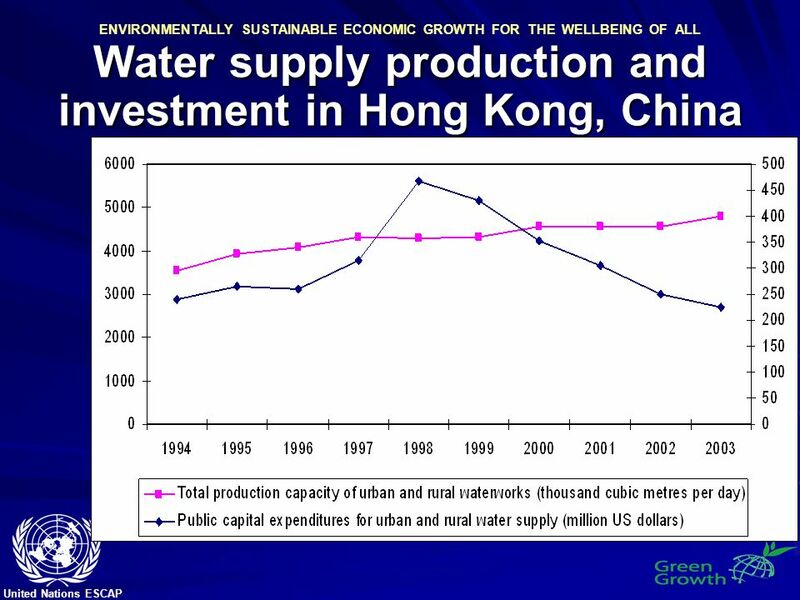 Chinas Economic Prospects: 2006 – 2020 Li Shantong. 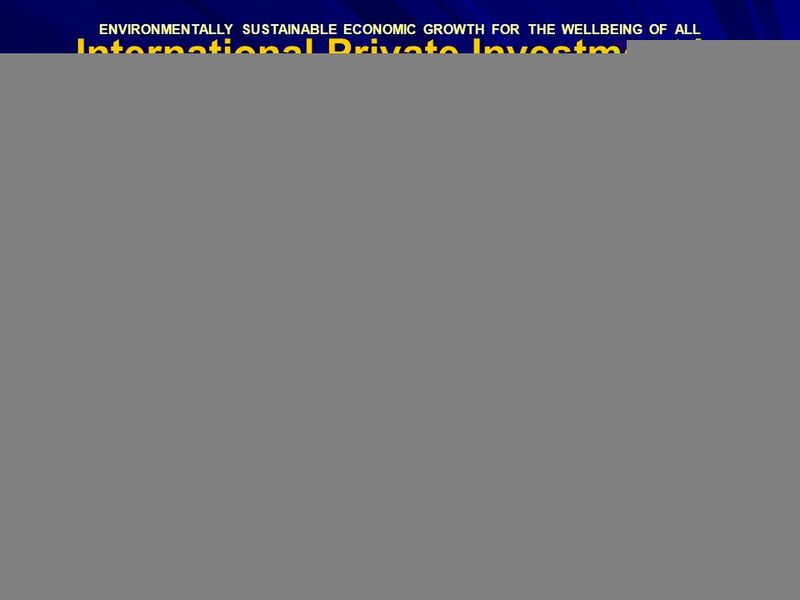 1 © United Nations Development Programme ACCLERETING PROGRESS TOWARDS THE MDGs IN AFRICA Selim Jahan Director, Poverty Division United Nations Development. 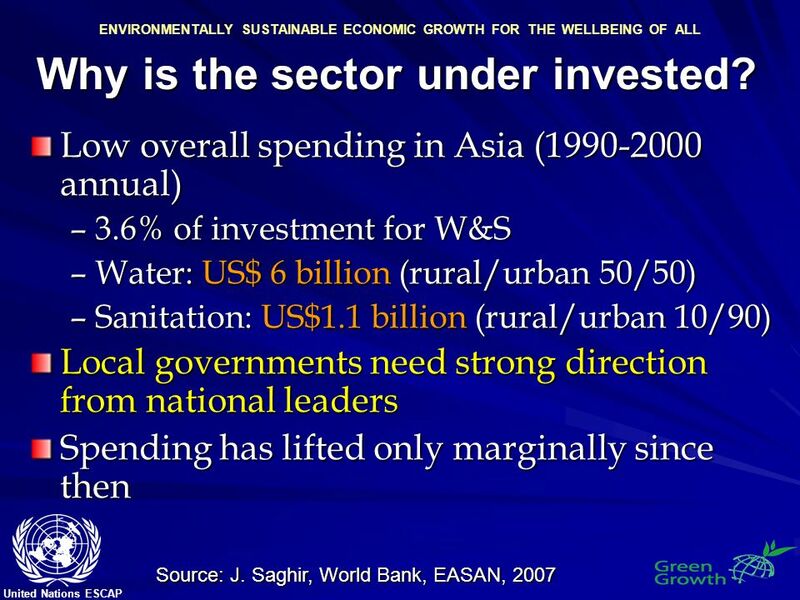 Reaching the marginalized Samer Al-Samarrai Child Friendly Budgets for 2010 and Beyond Policy Forum New York, February EFA Global Monitoring Report. 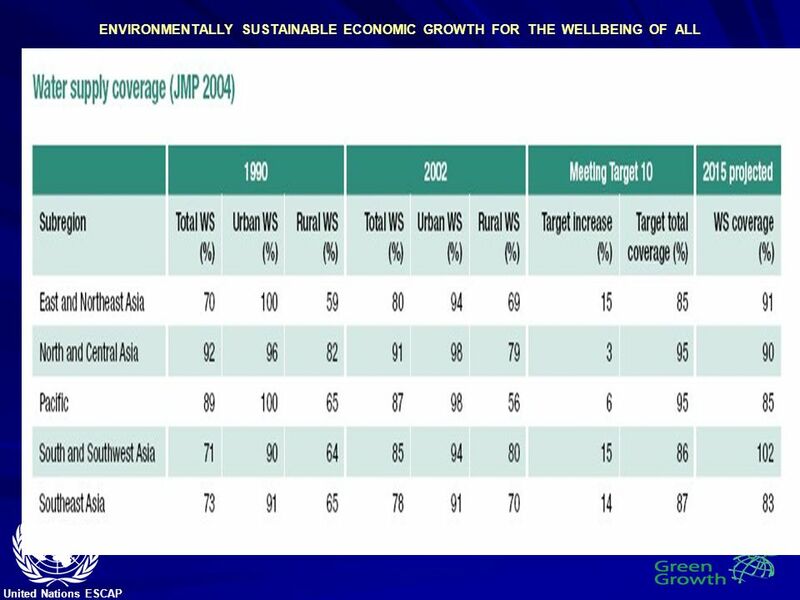 MDG-Based National Plans in Middle Income Countries Roddy Rivas-Llosa Head of Policies and Programs Peruvian Agency of International Cooperation July 2005.